I created this Hanging Mason Jar when I was in my studio yesterday. You just know I'm addicted to Mason Jars, don'tcha?! I just took a small Mason Jar and added a rusty tin frog lid to it. I also used some rusty wire and wrapped it around the neck of the bottle to create the hanger. Then I added a Rusty Tin heart and a little bit of homespun to the top of the hanger. My thought was to use this for potpourri/scented Prim Fixins, which is why I used the frog lid on top instead of a regular jar lid. But this could also be used for votive candles, or battery operated tealights. 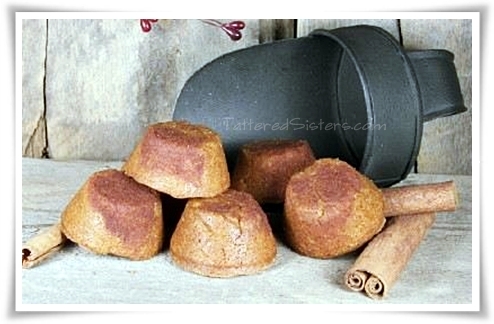 I thought I'd share some mini Pantry Cakes with you today. I just love all the things you can make with a Primitive Dough Recipe, so I use it a lot. I used a non-stick mini muffin tin to make these, let them cool once they were baked through, and then popped them out. Since they have shortening in them, they don't tend to stick. But you could probably spray your muffin tin if you wanted to. These are great as Primitive Bowl Fillers, especially if they are mixed with other fixins or goodies. What is it about July that makes me start thinking about Fall? That's kind of weird, don't you think? LOL. But for some reason, once mid-summer is here my head goes to Primitive Pumpkins and everything Autumn. So I just thought I'd share some Primitive Fall inspiration, in case you're like me and thinking about cooler weather and falling leaves--while the air conditioning is still on. Putka Pods are perfect for Fall because they look just like miniature pumpkins. I love them because they are so easy to add scent to, since they are much more porous than rosehips. They hold the scent really well and a little fragrance oil goes a really long way with these little guys. 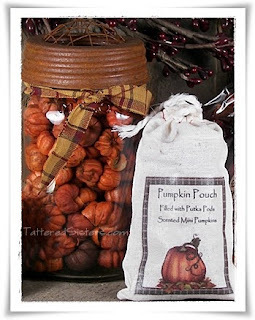 There are also lots of ways to package putka pods: in a jar, in little pouches with creative labels, in a clear cello bag, or how about a burlap bag with a pumpkin image stamped onto it--or maybe with a vintage pumpkin seed label? I think the ideas are pretty much endless. 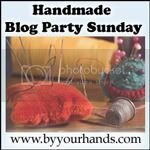 Hard to believe it, but this is my 200th post! So to celebrate this milestone and thank all of you for following me since the start of Tattered Sisters, I'm hosting a Primitive Giveaway! To enter this giveaway, all you have to do is add your first name and your email address to the form below. Please note: this is for contest entry and notification purposes only--I'm not signing you up for anything else when you enter the contest! There is a limit of one entry per person. One winner will be chosen at random and notified by email at the close of the contest period on July 15th. I will email you if you are the winner to get your shipping information. 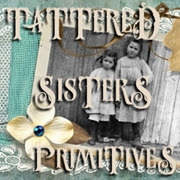 Good luck to each of you, and thank you so much for being a follower of Tattered Sisters Primitives!